Note: You can enter this giveaway one (1) time per e-mail address per day. Deadline is 11:59PM ET 12.26.18. Mangiare – American-style! 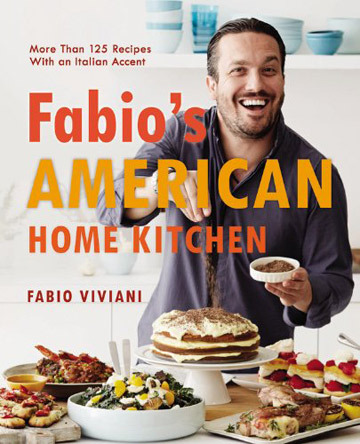 That’s what Italian-born chef and restaurateur Fabio Viviani does as he travels around his new home country. In more than 125 recipes for his favorite American dishes, he covers everything from Mac and Cheese to Yorkshire Pudding to Boston Cream Pie – all infused with his own special Italian flair. Each recipe is written with easy-to-follow instructions and is made with ingredients that can be found in almost every supermarket. You’ll be eating like a chef sooner than you think. NO PURCHASE NECESSARY TO ENTER OR WIN. Void where prohibited by law. Open to legal residents of the 50 U.S., D.C. and Canada (excluding Quebec) who are at least eighteen years old at the time of entry and have internet access. Begins on 12.5.18 at 12:00:00 a.m. ET and ends on 12.26.18 at 11:59:59 p.m. ET. To enter this giveaway, submit your full name and email address on this form. Odds of winning this giveaway depend on the total number of eligible entries received. Only one (1) entry per email address per day. Sponsored by Leite’s Culinaria, Inc. For more information, visit our Official Rules. For a list of winners, check out our Very Happy Winners page. Be sure to add giveaways@leitesculinaria.com to ensure notification if you are the winner.